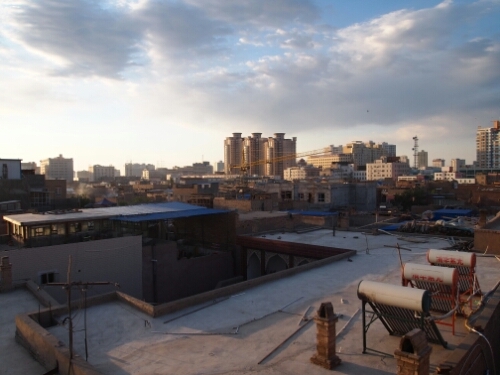 We decided to spend a couple of days in Kashgar to relax, get the bikes checked over, buy supplies and to see a bit of the city. 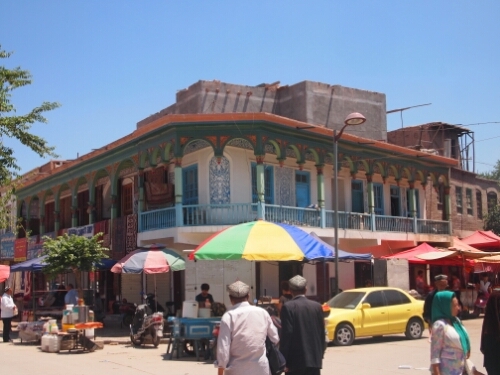 Kashgar was quite an interesting place as you can very clearly see the Uighur culture meeting the Han Chinese culture not in perhaps any great harmony. Where we were staying in the Uighur old city everything has a very central Asian/middle eastern feel and though it has a few nods to tourists is very run down/plain ancient. Around this old neighbourhood there are more modern Chinese buildings, including small skyscrapers and all the myriad unknowable public buildings that every Chinese town seems to collect. For someone coming from eastern China it must seem a very strange city with its many mosques, muslims and shashlik sellers. For me though this was the familiar and the occasional skyscraper and bits of Chinese architecture were the new and interesting. While there we managed to get everything done we had planned including buying a lot of weird Chinese snacks for a bit of variety on the road. Everything was a little bit more difficult now as Meka was unable to talk fluently with everyone as she had in Kyrgyzstan and now had even less idea than me what was going on most of the time. Ordering food had descended to pointing and hoping when there were no pictures in the menus or on the wall. 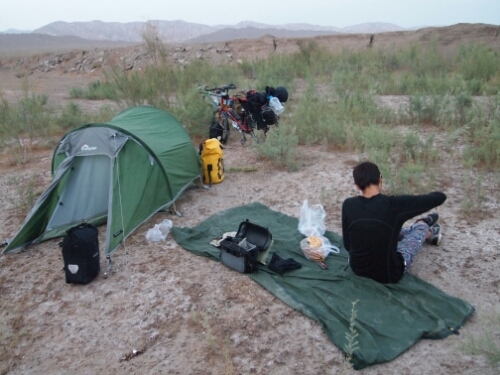 After the rigours of riding in Kyrgyzstan Meka wasn’t a hundred percent sure she wanted to carry on riding in China, she had found it pretty tough and it had been hard trying adapt our paces to each other as our levels of experience were so different. After a bit of convincing where I made it clear that there wouldn’t be any more mountains for a while and possibly ever on our route in China she agreed to at least give it a try to Urumqi the next major city on the route. 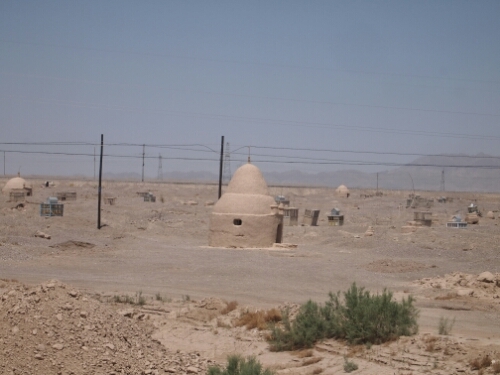 So we set out into some reasonably intense heat to work our way across the top of the Taklamaran Desert carrying a lot more water than we would do normally as it wasn’t always clear how much time there would be between settlements. 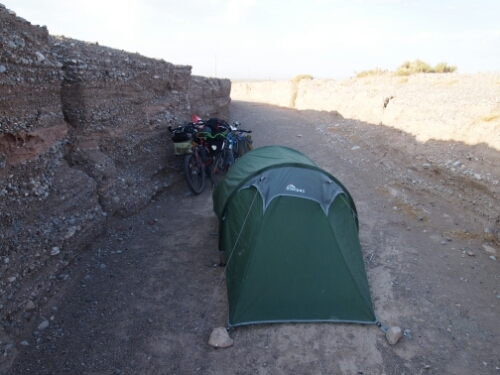 For most of the first day this was unnecessary as there was quite a lot going on for the first forty kilometres out of Kashgar. There were petrol stations and small villages not marked on my map. Meka met a Chinese policeman who was in fact ethnically Kyrgyz who gave her some advice and there was another fairy large town called Artux where we had an iced yogurt/honey drink that probably broke all the rules of travel food hygiene: the ice was crushed for instance and the yogurt not refrigerated. Thankfully we didn’t feel any after effects. That night we set up camp in a small depression a few hundred metres from the road fairly confident we were in the middle of nowhere. This illusion was shattered fairly quickly when a shepherd popped over for a chat. He was tending his flock that was grazing on some of the scrubby bushes that grow in these parts. Thankfully we made it through the night without any more visitors and continued on the next day riding through more desolate desert land. In the distance, every so often, we’d see a factory or a telecoms mast or sometimes a few houses where some people must be eking out a difficult existence. Today we were struggling ourselves a bit with headwinds and were finding the going a bit tougher, thankfully we knew the winds would eventually stop. 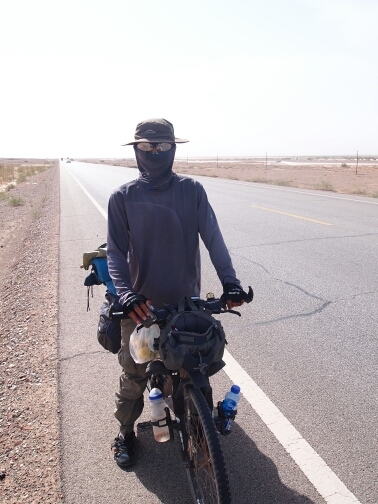 This was a Chinese cycle tourist doing the big loop around his country that is apparently very popular. He had a tailwind. Later that day we stopped at our first actual town for a while, which was good as we needed to stock up on water and to get some proper food in our bellys. Thankfully we were able to get some actual Chinese food in the shape of steamed rice and scrambled eggs and tomato. We were both a bit fed up of Uighur food as it is basically bad Kyrgyz food (and Kyrgyz food is already pretty bad!). As we rode out of the town to get a few more hours of riding in I remarked to Meka how calm it was now and easy to ride as the wind had dropped. Sadly I spoke too soon and as we rode we could see what looked like clouds of dust billowing out of a mine or factory. It looked very strange as if it was just a lot of dust being generated by the factory. This was not the case and as we rode closer we were suddenly hit by tremendous crosswinds. It was like passing through a curtain, one moment it was a nice calm sunny afternoon the next moment we were in an actual sandstorm. The wind was literally battering us and Meka was blown off the road a couple of times. Luckily the wind was coming left to right so we weren’t being blown into traffic. The wind wasn’t the only issue though as sand was whipping at us as well and visibility was very low. 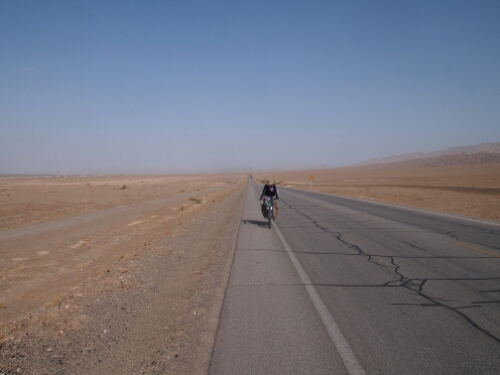 We made a bit of headway but it got worse and worse and we had to try and push our bikes some of the time as the wind was so strong. Every time a truck went past (of which there were quite a few on this road) we would be buffeted crazily, Meka’s shirt was almost ripped off as one truck went past. We didn’t want to go back as we didn’t know which way the storm was heading. 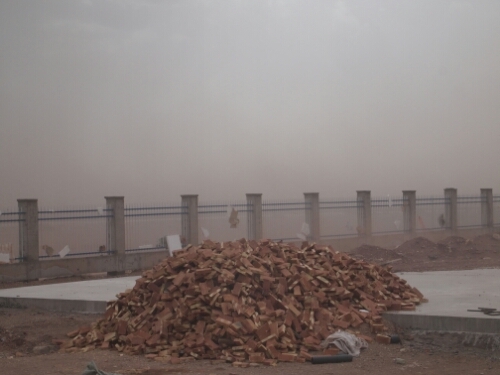 Then through the dust I spotted a largish building and we decided to try and seek shelter there. Reaching the building, which was more of a building site we went inside unchallenged apart from the bemused glances of Chinese construction workers. The building offered some protection as it had four walls but sadly no doors and only some windows. So while it kept the sand out it was still quite gusty. I didn’t really get any good photos of the storm as they are not the best places for cameras! Being in a sandstorm for me was pretty crazy, you don’t really get many/any in England and it seemed like something out of a film or the Arabian Nights stories, only less exciting and more uncomfortable in reality. After an hour or two of waiting the storm seemed to have died down considerably and while it was still windy we were able to continue. Throughout the rest of the evening there were a few more flurries and we were blown about a bit until things calmed down sufficiently for us to find another spot to camp. The next day the weather was much more pleasant and we carried on making good time with little trouble from the wind. A couple of Chinese taxi drivers stopped to give us gifts of Red Bull which they must carry by the crate to keep them going on their long fares. 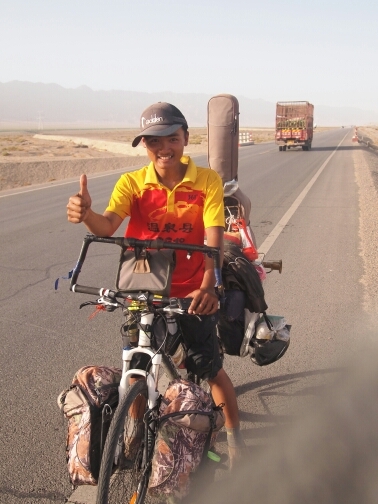 Only 19, he had started with just his bike and one small bag and through working as he went on his trip he had managed to accumulate lots of stuff he probably didn’t need including a guitar – a human life in microcosm. 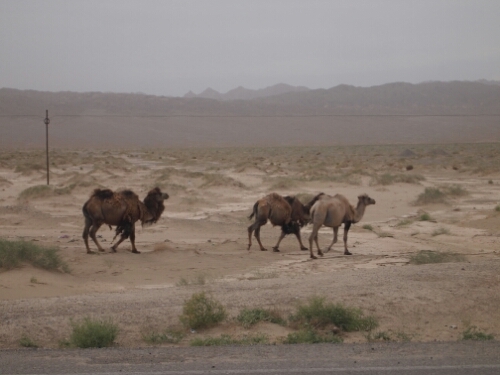 We also stopped at another small town that day but were only able to get Uighur food, which was a bit disappointing. The cafe workers were very curious about us and tried to communicate. Meka was starting to pick up some Uighur as it has similarities to Kyrgyz and sometimes she seems to be communicating quite well, it can depend on the effort the other person is putting in at times. Once more it was a bare campsite that night. The next day was similar if a little hotter and we got stuck briefly on an under construction highway which they hadn’t built the exit lane we wanted yet, so we had to carry on until we could find a path off. 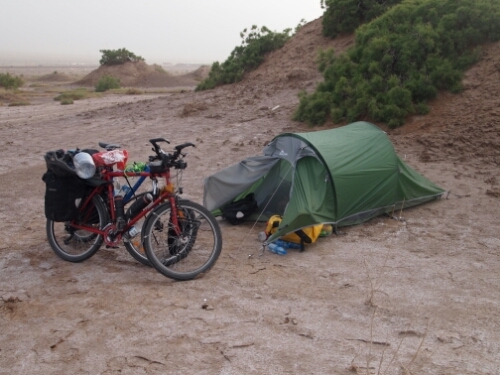 That night we camped in a dry riverbed, at this point we really wanted showers as we were still covered in dust from the sandstorm two days ago as well as the normal grime from riding in the heat. I slept terribly that night and felt really weird in the morning. I think it might have been from lack of salt as I had been sweating a lot and while I’d been drinking a lot of liquids I am not sure I was replacing my salt sufficiently. Going forward I’ve been adding a lot more to my food and I have not had the same problem. 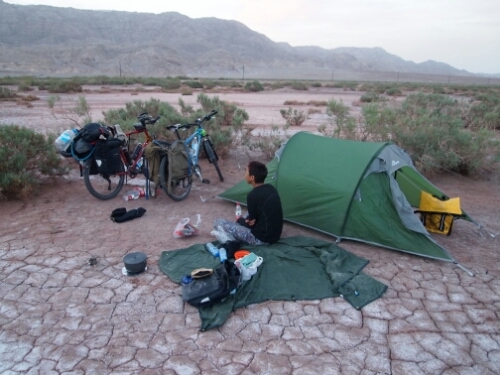 We really hoped that would be our last consecutive night camping in the desert as we hoped to reach the city of Aksu that day and so we rode hard to get there. As Aksu is pretty much in the middle of nowhere I was expecting it to be a larger version of the small highway towns we had passed two of on the way from Kashgar. These had been a few buildings running down the road spilling off a bit into the desert. Aksu I expected might have two streets instead of one and a few more buildings, so I was surprised when it was huge. There were massive new apartment blocks everywhere and more being built with cranes dotting the skyline. It took us quite a while just to find out where the downtown area was; there was definitely more than one street. A lot of it looked very new and I wondered what it would have looked like ten or twenty years ago. It was easy to see the scale of Chinese development here where it seemed they had been building up a whole city almost from scratch. Having arrived in the downtown area we thought we’d just be able to find a cheap hotel and take a rest. We didn’t realise our troubles were only just beginning. The first hotel we were directed to wouldn’t take us…it turns out that in China they have a number of stupid rules, one of these is that only certain licensed hotels can take foreigners. The lady in the first hotel pointed across the street to another hotel that we could stay in. This of course did not look like a cheap hotel at all and had an overly grand lobby and other unnecessary additions. We were pretty hot and tired at this point and so I thought I’d better try. So I went in and found out it was about triple what we wanted to pay and still about double even with some negotiation. So we went to try and find somewhere else, as we were going the duty manager of the hotel stopped us and through use of a surprisingly good translation app on his phone offered to try and help us find a cheaper hotel. Which he duly did, driving me round the corner to a hotel that agreed to take us for about half the price of his place. It was also a really nice hotel having everything we needed and more: beds, shower, wifi, a computer in the room and storage out back for the bikes. This was really very nice of him and something he didn’t have to do. Feeling pretty pleased we got settled and had our first showers for over four days and I got to use the internet for the first time in the while. That said the internet suffers from more stupid Chinese rules as China blocks most stuff that would be useful, including googlemaps. Then our peace was shattered as a knocking came at the door; it was the police. Seeing me they were clearly confused and after looking at my passport they made some gestures which I thought meant we had to pack up and leave but which I wasn’t sure about. I also wasn’t sure if they had happened upon us in a random check or were actually looking for us. As I wasn’t sure if they had been telling us to leave or not we decided to wait a bit and then go downstairs with our laundry to see what was happening. As we waited and they didn’t come back we started to think that maybe they had gone and it was a misunderstanding. After we had let enough time pass we gathered our laundry and headed down to see what was what. What was what was that a policeman was waiting by reception and we were told to sit down and wait – I didn’t think we were going to get our laundry done. After a bit more waiting three more policeman arrived: two men and a woman. One of the men was carrying an assault rifle, I assume this is because Meka looks a bit dangerous. The large assault rifle was not their only weapon, the woman with them was armed with English and she was clearly the Official English Speaker, probably for the whole of Aksu’s police department. The lady then proceeded to explain that we would have to leave this hotel and go to a ‘normal’ hotel as they can’t register us at this one and that by staying in this hotel we were Breaking the Law, I could almost hear the dramatic chords hanging in the air after this statement. So we had to go and pack up all our bags get our bicycles and load them up in order to be led across the road to a ‘normal’ hotel. it turns out that normal means a smaller room, no wifi, no computer and a much heftier price tag. Normal also includes a genuinely awful breakfast and a strong sense of frustration. That said in spite of the large gun the police were quite nice and weren’t intimidating at all and the English speaking lady was very pleasant and was in the end Just Doing Her Job.